From their humble beginnings, Autoflowering Seeds have grown and flourished.. Originally the yields from these early strains were relatively low, as were the THC levels. However, as the genetics have advanced, so in turn have the yields. Much of the reason for these low yields was due to high quantities of the Ruderalis gene to induce the auto flowering mechanism. Over time the genetics have been developed, reducing the Ruderalis gene with genetics that offer a far superior return. Until the last five years, the number of Autoflowering strains available were very limited, offering only a handful of varieties. The choice of Autoflowering strains has grown dramatically over the last few years as the Marijuana Seed company’s all began to produce their own Autoflowering Seeds. Where possible, purchasing your Autoflowering seeds feminized maximizes your potential return per square meter. 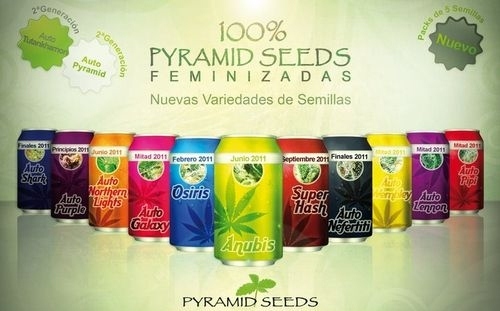 This is because the feminized Marijuana seeds that you plant should return nothing but true female only plants. When buying any Autoflowering Seeds feminized or regular, always ensure that you are purchasing from a reputable supplier. VegPage offers a high quality service ensuring that you receive the genuine Marijuana Seeds of your choice. If you are looking or any type of Marijuana seeds to the USA, Canada or Europe, Autoflowering seeds feminized or regular, VegPage has a wide and varied selection, all at the lowest prices available online. With access to over 1,200 seeds and strains, you’re sure to find the perfect seeds for your garden. Learning how to grow Autoflowering seeds couldn’t be easier. Autoflowering seeds do not require the customary twelve hours of darkness to induce flowering as required by regular and feminized Marijuana seeds. For many growers of outdoor Marijuana seeds, maintaining constant, uninterrupted hours of darkness for the complete flowering cycle can be a problem. By growing Autoflowering Seeds these worries are significantly reduced. During the long Summer days, Autoflowering seeds provide the perfect addition to your outdoor garden by flowering automatically, while your feminized or regular Marijuana seeds are still in their vegative state. Another major advantage people discover when they grow Autoflowering Seeds is the speed with which they mature. With a reduced vegative time, most Autoflowering seeds are mature from seed in approximately eight to ten weeks from germination. Which is the Fastest Autoflowering Strain? There are many different fast Autoflowering strains, and almost all the major Seed Banks have a Super-Fast Auto. Some of the fastest Autoflowering strains are; Royal Queen Seeds Quick one, Kannabia Seeds Kritic, Genehtik Seeds Kritikal, Samsara Seeds Thunder Bloody Mary, Sweet Seeds Sweet Cheese, Green House Seeds Auto Bomb, Ministry of Cannabis Devilmatic, Female Seeds Automatic Jack, Short Stuff Seeds Sharkbite, Joint Doctor Seeds Betty Boo, Dutch Passion Seeds Think Different, and Buddha Seeds Red Dwarf. Can You Grow Autoflowering Seeds Indoors? Yes, Autoflowering Seeds can be grown indoors. It is best to buy Autoflowering Seeds feminized, as they ensure female plants. It is important that adequate hours of high quality light is provided. LED lights have proven cost effective and efficient. How To Grow Autoflowering Seeds Outdoors. The best way to grow Autoflowering Seeds outdoors is to germinate and raise your young seedlings indoors under artificial light first. Once they have developed their third/fourth set of true leaves, they should be strong enough to plant outdoors. What Is The Best Way To Grow Autoflowering Strains? Autoflowering seeds and strains can be grown both indoors and outside. Optimum conditions cannot be guaranteed in many countries, so therefore if optimum light, air and nutrient conditions are met, often growing Autoflowering strains indoors is more productive. Are Autoflowering Seeds Worth It? When they were initially released many people wondered were Autoflowering Seeds worth it. Low yields and poor quality were many people’s expectations. Luckily the advancements have made many of the latest releases very worth while, with heavy yields and a high quality product. Autoflowering Seeds have developed rapidly over the last decade. Discover the wide choice now available at VegPage your supplier of genuine Autoflowering Marijuana Seeds to the USA. This entry was posted on January 27, 2013 at 12:52 pm and is filed under Marijuana Seeds. You can follow any responses to this entry through the RSS 2.0 feed.